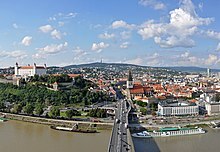 The Group traces its origins to the summit meetings of leaders from Czechoslovakia, Hungary, and Poland held in the Hungarian castle-town of Visegrád on 15 February 1991. Visegrád was chosen as the location for the 1991 meeting as an intentional allusion to the medieval Congress of Visegrád in 1335 between John I of Bohemia, Charles I of Hungary and Casimir III of Poland. After the dissolution of Czechoslovakia in 1993, the Czech Republic and Slovakia became independent members of the group, thus increasing the number of members from three to four. All four members of the Visegrád Group joined the European Union on 1 May 2004. The name of the Group is derived, and the place of meeting selected, from the 1335 Congress of Visegrád held by the Bohemian (Czech), Polish, and Hungarian rulers in Visegrád. Charles I of Hungary, Casimir III of Poland, and John of Bohemia agreed to create new commercial routes to bypass the city of Vienna, a staple port (which required goods to be off-loaded and offered for sale in the city), and to obtain easier access to other European markets. The recognition of Czech sovereignty over the Duchy of Silesia was also confirmed. The second Congress took place in 1339, where it was decided that after the death of Casimir III of Poland, the son of Charles I of Hungary, Louis I of Hungary, would become King of Poland provided that Casimir did not have a son. From the 1500s, large parts of the present-day countries became part of or were influenced by the Vienna-based Habsburg Monarchy, until after the end of World War I and the dissolution of the Habsburg-ruled Austria-Hungary. After World War II, the countries became satellite states of the Soviet Union as the Polish People’s Republic, the Hungarian People’s Republic and the Czechoslovak Socialist Republic. In 1989 came the Fall of the Berlin Wall and after the Fall of Communism in Central and Eastern Europe, and by 1990, the three Communist People’s Republics ended. In December, 1991, the Soviet Union collapsed. In between, the Visegrád Group was established on 15 February 1991. The group was referred to as the Visegrád Triangle prior to the dissolution of Czechoslovakia into the Czech Republic and Slovakia in 1993. All four nations in the Visegrád Group are high-income countries with a very high Human Development Index. V4 countries have enjoyed more or less steady economic growth for over a century. In 2009, Slovakia adopted the euro as its official currency and is the only member in the Group to do so. If counted as a single nation state, the Visegrád Group would be the fifth largest economy in Europe and the 12th largest in the world. Based on gross domestic product per capita (PPP) estimated figures for the year 2018, the most developed country in the grouping is the Czech Republic (USD 36,784 per capita), followed by Slovakia (USD 35,095 per capita), Poland (USD 31,430 per capita) and Hungary (USD 31,370 per capita). The average GDP (PPP) in 2018 for the entire group is estimated at around USD 32,500. Within the EU, the V4 countries are pro-nuclear power, and are seeking to expand or found (in the case of Poland) a nuclear power industry. They have sought to counter what they see as an anti-nuclear power bias within the EU, believing their countries would benefit from nuclear power’s zero emissions and high reliability. The economy of the Czech Republic is the group’s second largest (GDP PPP of USD $359.054 billion total, ranked 50th in the world). Before the Second World War, Czechoslovakia was one of the most advanced countries in the world. However, the subsequent 41 years of socialism with communist leadership had a significant impact on the country’s economy. Since the Velvet Revolution in 1989 and the dissolution of Czechoslovakia in 1993 the Czech Republic has successfully transformed itself into a free market economy. Today, the Czech Republic is a highly industrialized country and is, according to the World Bank, one of the world’s thirty most developed countries. The principal industries in the Czech Republic are machinery (transportation, electronics), chemical industry, metallurgy and food processing. Other major industry sectors are energy, construction and retail. The arms and glass industry are less important, however they have a long tradition in Bohemia. Industry accounts for 35% of the Czech economy. The Czech Republic is the second biggest producer of cars per capita, first being Slovakia. The main producers are Škoda Auto, Peugeot-Citroen, Toyota and Hyundai. Other major companies include ČEZ (biggest company in Central and Eastern Europe), Škoda Works (manufacturer of rail vehicles), Panasonic (electronics), Tatra (heavy truck manufacturer), ArcelorMittal (metallurgy), PPF (largest Central European investment group) Pilsner Urquell (brewing) Aero (aerospace). Hungary has the group’s third largest economy (total GDP of USD $265.037 billion, 57th in the world). Hungary was one of the more developed economies of the Eastern bloc. With about $18 billion in foreign direct investment (FDI) since 1989, Hungary has attracted over one-third of all FDI in central and eastern Europe, including the former Soviet Union. Of this, about $6 billion came from American companies. Now it is an industrial agricultural state. The main industries are engineering, mechanical engineering (cars, buses), chemical, electrical, textile, and food industries. The services sector accounted for 64% of GDP in 2007 and its role in the Hungarian economy is steadily growing. The main sectors of Hungarian industry are heavy industry (mining, metallurgy, machine and steel production), energy production, mechanical engineering, chemicals, food industry, and automobile production. The industry is leaning mainly on processing industry and (including construction) accounted for 29.32% of GDP in 2008. The leading industry is machinery, followed by the chemical industry (plastic production, pharmaceuticals), while mining, metallurgy and textile industry seemed to be losing importance in the past two decades. In spite of the significant drop in the last decade, the food industry still contributes up to 14% of total industrial production and amounts to 7-8% of the country’s exports. Agriculture accounted for 4.3% of GDP in 2008 and along with the food industry occupied roughly 7.7% of the labor force. Tourism employs nearly 150,000 people and the total income from tourism was 4 billion euros in 2008. One of Hungary’s top tourist destinations is Lake Balaton, the largest freshwater lake in Central Europe, with 1.2 million visitors in 2008. The most visited region is Budapest; the Hungarian capital attracted 3.61 million visitors in 2008. Hungary was the world’s 24th most visited country in 2011. Poland has the region’s largest economy (GDP PPP total of USD 1.193 trillion, ranked 21st in the world). According to the United Nations and the World Bank, it is a high-income country with a high quality of life and a very high standard of living. The Polish economy is the sixth-largest in the EU and one of the fastest-growing economies in Europe, with a yearly growth rate of over 3.0% before the late-2000s recession. Poland is the only European Union member to have avoided a decline in GDP, and in 2009 created the most GDP growth in the EU. As of December 2009, the Polish economy had not entered recession nor contracted. According to Poland’s Central Statistical Office, in 2011 the Polish economic growth rate was 4.3%, the best result in the entire EU. The largest component of its economy is the service sector (67.3%), followed by industry (28.1%) and agriculture (4.6%). Since increased private investment and EU funding assistance, Poland’s infrastructure has developed rapidly. Poland’s main industries are mining, machinery (cars, buses, ships), metallurgy, chemicals, electrical goods, textiles, and food processing. The high-technology and IT sectors are also growing with the help of investors such as Google, Toshiba, Dell, GE, LG, and Sharp. Poland is a producer of many electronic devices and components. Mineral extraction includes black and brown coal, copper, lead, zinc, salt, sulfur, magnesite, kaolin, and small amounts of oil and natural gas. The smallest, but still considerably powerful V4 economy is that of Slovakia (GDP of USD $158.428 billion total, 70th in the world). Czechoslovakia was the most developed country of the Eastern Bloc when the Communism ruled in Central Europe. The first years after the revolution in 1989 saw a stagnation. At the end of the 1990s, the economy grew and attracted considerable investment from abroad. Slovakia produces the most cars per capita of any country in the world, over 1 million cars per year. The population is 64,301,710 inhabitants, which would rank 22nd largest in the world and 4th in Europe (very similar in size to France, Italy or the UK) if V4 were a single country. Most people live in Poland (38 million), followed by the Czech Republic (nearly 11 million), Hungary (nearly 10 million) and Slovakia (5.5 million). SÚZA in Bratislava, former seat of the International Visegrád Fund (2000–2006). The only solid organization of the Visegrád co-operation is the International Visegrád Fund (IVF), established in 1999, with its seat in Bratislava. According to a decision of the prime ministers, the Fund has an annual budget of EUR 8 million as of 2014. With more than 11 annual deadlines and irregular calls for proposals the fund awards grants, scholarships and research fellowships, and artist residencies. Main recipients of its funding are citizens and non-governmental organizations from the V4 region, as well as countries of the Western Balkans, the Eastern Partnerships, and other countries. Visegrád Fund building in Bratislava. On 12 May 2011, Polish Defence Minister Bogdan Klich said that Poland will lead a new EU Battlegroup of the Visegrád Group. The decision was made at the V4 defence ministers’ meeting in Levoča, Slovakia, and the battlegroup became operational and was placed on standby in the first half of 2016. The ministers also agreed that the V4 militaries should hold regular exercises under the auspices of the NATO Response Force, with the first such exercise to be held in Poland in 2013. The battlegroup included members of V4 and Ukraine. Another V4 EU Battlegroup will be formed in the second semester of 2019. On 14 March 2014, in response to the 2014 Russian military intervention in Ukraine, a pact was signed for a joint military body within the European Union. In 2002 Hungary initiated establishment of an Expert Working Group on Energy. This expert group meets once or twice a year in V4 capitals on a rotation basis, and the head of the host country delegation always chairs the meeting. Recommendations of general nature in the sphere of energy policy, including energy research and development. Recommendation to consider development of emergency natural gas storage. Recommendation to consider construction of new gas and oil pipelines and of new marine LNG terminals. Recommendations in the field of interconnecting power transmission grids. Created by an agreement signed in Bratislava on February 26, 2015, the Institute aims at operating as an International Searching Authority (ISA) and International Preliminary Examining Authorities (IPEA) under the Patent Cooperation Treaty (PCT) as from July 1, 2016. All members of the V4 are Member states of the European Union since the 2004 enlargement of the European Union and are also members of the Schengen Area since 2007. Austria is the Visegrád Group’s southwestern neighbor. The Czech Republic, Slovakia and Austria launched the Austerlitz format for the three countries in early 2015. The first meeting in this format took place on January 29, 2015 in Slavkov u Brna (Austerlitz) in the Czech Republic. Petr Drulák, the deputy minister of the Czech Republic, emphasized that the Austerlitz format was not a competition, but an addition to the Visegrád group. The leadership of the Freedom Party of Austria, the junior partner in the Austrian coalition government, has expressed its willingness to closely cooperate with the Visegrád Group. Chancellor and leader of the Austrian People’s Party Sebastian Kurz wants to act as bridge builder between the east and the west. Germany, Visegrad Group’s western neighbor, is a key economic partner of the group and vice versa, while “Germany’s trade and investment flows with the V4 are greater than with China” as of 2018. Poland borders non-EU countries Belarus and the Russian enclave Kaliningrad on the east, while Hungary, Poland and Slovakia border Ukraine on their east. The Czech Republic is fully surrounded by other EU members. Hungary borders Serbia on the south, which is a candidate for EU accession. Ukraine, an eastern neighbor of the V4 that is not a member of the EU, is one of largest recipients of the International Visegrad Fund support and receives assistance from the Visegrad Group for its aspirations to European integration. Ukraine joined the Deep and Comprehensive Free Trade Area with the EU and therefore with the V4 in 2016. ^ “The Bratislava Declaration of the Prime Ministers of the Czech Republic, the Republic of Hungary, the Republic of Poland and the Slovak Republic on the occasion of the 20th anniversary of the Visegrád Group”. Official web portal of the Visegrád Group. Archived from the original on 24 August 2014. Retrieved 24 May 2015. ^ Engelberg, Stephen (17 February 1991). “Three Eastern European Leaders Confer, Gingerly”. The New York Times. Retrieved 11 April 2009. ^ “Aggregate And Per Capita GDP in Europe, 1870-2000: Continental, Regional and National Data With Changing Boundaries, Stephen Broadberry University of Warwick” (PDF). Dev3.cepr.org. 27 October 2011. Archived from the original (PDF) on 30 October 2013. Retrieved 7 September 2013. ^ “Visegrád group backs nuclear energy”. China.org.cn. 14 October 2013. Retrieved 1 May 2016. ^ “Don’t impede our nuclear, V4 tells EU”. World-nuclear-news.org. 15 October 2013. Retrieved 1 May 2016. ^ “V4”. International Monetary Fund. Retrieved 17 June 2014. ^ “Elemzői reakciók az ipari termelési adatra (Analysts’ Reaction on Industrial Production Data)” (in Hungarian). 7 April 2009. Archived from the original on 27 February 2012. Retrieved 18 January 2010. ^ “Food Industry”. Itdh.com. Archived from the original on 13 July 2011. Retrieved 18 January 2010. ^ “Táblamelléklet (Tables)” (PDF). Hungarian Central Statistical Office. Retrieved 18 January 2010. ^ “UNWTO World Tourism Barometer” (PDF). World Tourism Organisation. January 2013. Archived from the original (PDF) on 19 August 2008. Retrieved 3 January 2013. ^ “Report for Selected Countries and Subjects”. Retrieved 28 April 2018. ^ “Country and Lending Groups | Data”. Data.worldbank.org. Retrieved 9 November 2010. ^ “SPI PROGRESS INDEX 2015”. Archived from the original on 17 December 2015. Retrieved 16 December 2015. ^ “Quality of Life Index by Country 2017 Mid-Year”. Numbeo.com. Retrieved 1 October 2017. ^ Toshiba Invests in a Subsidiary of LG.Philips LCD in Poland. eCoustics.com (2006-10-10). Retrieved on 2013-07-19. ^ “IMF — International Monetary Fund Home Page”. Imf.org. ^ “Wayback Machine” (PDF). Web.archive.org. 16 January 2013. Archived from the original (PDF) on 16 January 2013. Retrieved 1 October 2017. ^ “Czech Republic Population 2016”. World Population Review. Retrieved 1 May 2016. ^ “2011. ÉVI NÉPSZÁMLÁLÁS : 3. Országos adatok” (PDF). Ksh.hu. Retrieved 1 October 2017. ^ “Bratislava Declaration of the Visegrád Group Heads of Government on the Deepening V4 Defence Cooperation”. Visegradgroup.eu. Visegrád Group. 9 December 2015. Retrieved 10 July 2015. ^ “Today’s Stock Market News and Analysis”. Nasdaq.com. Retrieved 1 May 2016. ^ “Visegrad Group Defence Cooperation”. Visegrad Group. 9 December 2014. Retrieved 30 October 2017. ^ Schubert, Gerald (11 April 2015). “Österreich, Tschechien, Slowakei: Gemeinsame Politik im Austerlitz-Format” (in German). Der Standard. ^ Stephan Löwenstein. Zwischen Wien und Budapest. Frankfurter Allgemeine Zeitung Published on 15.10.2017. ^ Alexe, Dan (1 February 2018). “Kurz and Orban want to clip Brussels’ power, but Austria will not join Visegrad Four”. New Europe. Retrieved 2 February 2018. ^ Claudia Patricolo. Ukraine looks to revive V4 membership hopes as Slovakia takes over presidency. emerging-europe.com. July 29, 2018. ^ EU-Ukraine free trade ‘set for 2016’ – President Poroshenko. BBC News. 17 November 2015.